The Ethan Allen Gateway Streetscape project page is updated with NEW design alternatives presented at the June 14 Open House. Check them out! Takoma Park’s New Hampshire corridor is served with excellent public transportation via Ride On (Montgomery County), Metrobus (WMATA), TheBus (Prince George’s County) all of which connect to shopping, universities, and Metrorail stations in Takoma Park, Silver Spring, the District and Prince George’s County. The University of Maryland also runs a shuttle bus along University Boulevard which may be hailed at any bus stop. Nearly all stops on the New Ave have comfortable (and colorful) seating so you may sit in style when waiting for your bus. From the Takoma Metro, catch Ride On 16 or 18 and the Metrobus F1 / F2. From Fort Totten Metro or White Oak, catch the Metrobus K6 or the new limited-stop K9, anywhere on the New Ave.
From College Park or the University of Maryland catch the Metrobus F6. From Prince George's Plaza catch TheBus 18 to go the Takoma Langley Crossroads and the Metrobus F1 / F2 to go to the Ethan Allen Gateway. The Sligo Creek Hiker Biker Trail connects Takoma Park to Wheaton and the Northwest Branch and Paint Branch Trail systems including College Park University of Maryland and the West Hyattsville Metro Station. Bike routes along tree-lined residential streets are an easy way to get around, and a few brave bicycle commuters venture onto New Hampshire Avenue itself. As the Avenue is currently being repaved, the roadway and sidewalk surfaces will undergo substantial improvements. 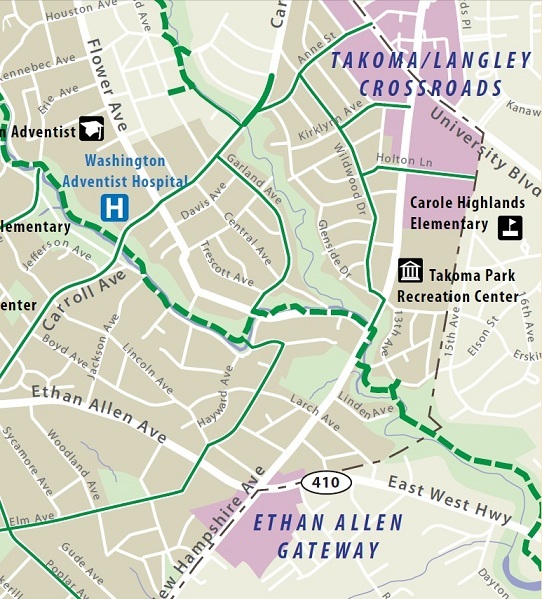 Download the Takoma Park Bike Map (right) to get info on bike routes connecting the New Ave with Takoma Park, and the rest of the region. 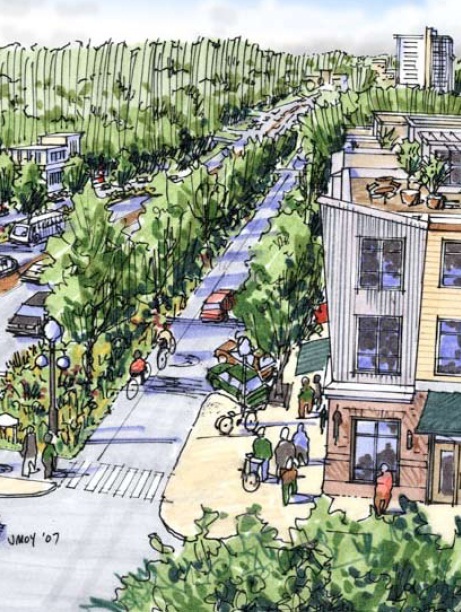 There are wonderful places to walk to on the New Ave – not just in the neighborhoods. Walking guides are a great way to get to know businesses and explore what the sights, sounds, and tastes that the New Ave has to offer. Most people see the New Ave from the window of a car. About 40,000 cars per day drive on New Hampshire Avenue. There are many automotive services should you need fuel or help along the way. Easy access to the Beltway and downtown DC via North Capitol Street explains why so many residents and businesses have chosen to locate here. Building on the recommendations in the K6 Priority Bus Corridor Study Final Report, the new K9 MetroExtra route started service on New Hampshire Avenue in 2013. There are five K9 stops on the New Ave; at the Maryland Gateway, Poplar Avenue, Ethan Allen Gateway, and at Kirklynn Ave and Lebanon Street in the Takoma/Langley Crossroads. Metro plans to extend the route north to White Oak, and reroute it south of Eastern Avenue to serve the upcoming Fort Totten Square development. WMATA's C2/C4 Priority Bus Corridor Study kicked off in 2013 and explores ways to improve the Metrobus lines along University Boulevard. Opportunities for community involvement began in April 2013. The F4/F6 Priority Bus Corridor Study was completed in 2012, the final report with recommendations are available for download.